How quickly six weeks passed. Time to put Rhapsody back on the hard and return to Oregon. But are we returning home, or leaving our home? This six weeks has felt like a new beginning, and yet our new life has not quite begun yet. We return to our house that has already begun to feel less like a home to us. What are we returning to? Artwork is off the walls (well, mostly ), Ziggy is at his new home, one garage sale has taken care of a chunk of stuff, and now we have to continue the process. Getting rid of things, getting the house ready to sell, making tough choices, all while wishing we were back on Rhapsody. It is a lot of work getting Rhapsody ready to be left. Everything has to be cleaned, clothes, linens, cupboards, refrigerator. Anything that could catch the wind has to be removed or tied down. The boat has to be hauled out and tied down. This time we are in a boatyard that uses sand screws as added protection for the hurricanes. Then off to the ferry to catch a plane to fly across the US. Sometimes you just have to make choices. 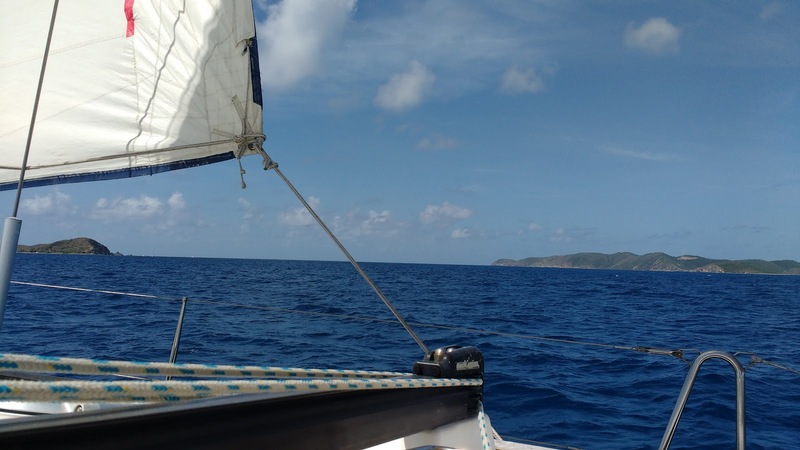 While we enjoy both sailing and diving it is hard to do both, and do them both well. Sailing is sailing. Diving is diving. They are two very different creatures.